I also think we’re maturing together, as a nation. Nowadays, almost every time people sing God Defend New Zealand – at a school, at a sports match or a formal ceremony – we sing it in both Māori and English. It wasn’t always that way – only in the past 15 years has it become widespread. New Zealanders just started doing it, because it felt right. It feels like the right kind of representation of who we are as a nation. It’s the type of understated change that appears small, but one I think speaks volumes about how we have grown. So in 25 years’ time, when New Zealand celebrates 200 years of nationhood, there are some changes I’d like to see. In 2040, every willing and able iwi will be settled. In 2040, all Māori owned land will be far better utilised, delivering jobs and prosperity, particularly for those in regional areas. And in 2040, I want to see the disparity in educational achievement eliminated. For young Māori, this means really digging in to lift achievement. For the Government, it means ensuring our education system works for all students. It also means developing initiatives to support young people and families in other areas. Like free doctors’ visits for under-13s. Like subsidising early childhood education. And getting our schools, social organisations and law enforcement agencies to work together so children don’t stumble into a life of petty crime or welfare dependency. Governments can’t make these changes by themselves. We also need to get alongside families and give them the right support. It’s not just about throwing money at a problem. Because you can’t buy the dedication of communities who want to rid their streets of drugs and crime. And you can’t buy the dedication of a mother who is trying to keep her 14-year-old son in school. When you give families what they actually need, great changes can happen. Māori children, for example, are now being immunised at nearly double the rate they were in 2007. So I’ve no doubt the willingness – and the ability – to chase success in education is there, with the right support. Because welfare dependency got a mention I thought I'd look at Maori statistics. 5 years ago 31.4 percent of people on benefit were Maori. Today it is 34.5 percent. Over a third of working-age people on welfare are Maori, yet Maori make up just 15 percent of the total population. The Maori working age (18-64) population is 386,360 with 106,567 on welfare - 27.6 percent. High but it's been worse. There are 37,275 Maori on Sole Parent Support compared to 32,378 NZ European. Roughly, Maori are three times as likely to rely on welfare than non-Maori. As well as aiming for the "elimination of disparity in educational achievement" by 2040, the elimination of disparity in welfare dependence would be a great thing. Perhaps the second will follow the first. I hope I am around to see it. When the media could be covering incredible orators with vast knowledge like Moana Jackson and Annette Sykes, when they could be asking young Māori what Te Tiriti means to them, when they could be approaching Pākehā historians like Anne Salmond or James Belich to educate us, to expand our views, to move us on, they are trailing around after a bloke who doesn't like cats. No disrespect Mr Morgan, but check your privilege here. I don't actually like the things you are saying - I think they are cloaked in dangerous, racist discourses like one law for all and Treaty industry - but as importantly, I don't like the fact you are taking advantage of your privilege to influence public debate on a topic you are ill-qualified to comment. Perhaps you could use your influence to help ensure we hear the voices of people who have dedicated their lives to understanding Te Tiriti and colonisation? 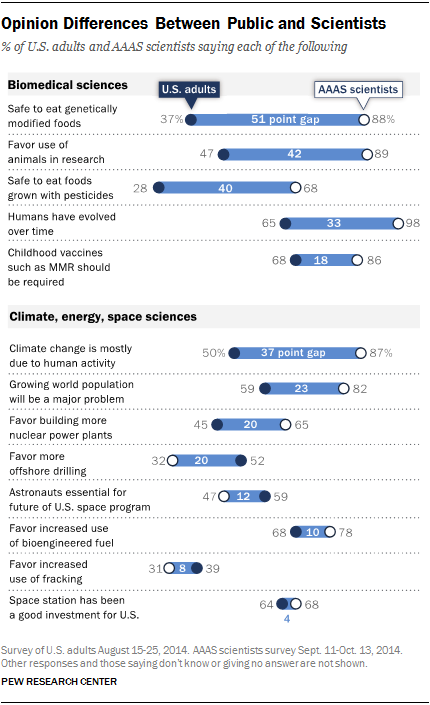 Fascinating infographic from the Scientific American shows big gaps between what scientists believe and what the public think. Jeepers. A lot of people (both public and scientists) must spend a lot of time worrying. I never give food safety, human evolution, nuclear power, world population growth, space exploration funding, offshore drilling or fracking more than a passing thought. When inexpert I tend to trust scientific consensus. A poll of difference between what the public and social scientists think would be more up my alley. What went wrong with Gareth Morgan's plan to re-educate those people who 'ignorantly' share in what he calls 'Brash-think'? Only 19 people turned up at Orewa. Apparently that number was matched by the media presence. Morgan got the pre-publicity through Monday's NZ Herald. Then Sean Plunket picked it up and got Don Brash on his show to talk about whether his views had changed in the interim. Later Morgan was a guest on the Mau/Jackson show (though I didn't listen so can't confirm that.) Next Morgan invites Brash to Orewa which should set up a showdown guaranteed to attract hundreds. If you saw him on TV3 last night - during the news, then on Campbell Live - you were watching a very disgruntled man. Made even more glaring by Don's usual imperturbability and good humour. Whereas Morgan was sniping at Brash's political appeal to ACT, United Future and NZ First types (code for red-necks) Brash expressed his view that for Maori to get ahead reformed: education, welfare and land ownership were key. I am also pretty sure that after a shot of Gareth and Don chatting amiably 'off-camera' the next offering was Morgan describing Brash and similar thinkers as 'racist' out in the car park. Declaring my bias, I do not like Gareth Morgan. My own personal experience of him left me suspecting his motives. Perhaps he has become over-exposed? Perhaps his popularity and influence are wearing thin. Or perhaps those of us who think like Brash are tired of arguing about it and stayed away. And the Maori that Morgan would curry favour with don't want him on their case. You may have your own answer. I'd be interested. Thanks for inviting me here today, and for the opportunity to comment on what Gareth has said. I didn’t see the speech in advance of course, so these comments are just immediate reactions based partly on what Gareth said a few days ago in a speech to a Ngapuhi audience. Let me say first that there are some of Gareth’s views with which I agree. He said in his Ngapuhi speech that he is opposed to separate Maori electorates, Maori wards (and by implication the Maori Statutory Board in Auckland) and quotas for Maori in educational institutions. Granting any group special rights is contrary to Article 3 of the Treaty he said, and I totally agree with that. It’s also patronising, and implies that Maori aren’t quite competent enough to have their voices heard in the political arena without a special leg up. Of course that is nonsense: when I was in Parliament, there were 21 Maori in Parliament – roughly the same percentage of Members of Parliament as Maori are in the wider population – only seven of them elected in the Maori electorates. The other 14 were elected in general constituencies or were placed in a winnable position on a party’s list. Similarly in Auckland: the first election of councillors after the super-city was established in 2010 saw three people of Maori descent elected – not in Maori wards but on their own merits – and again three Maori out of a total of 20 councillors meant that Maori on the Council were in roughly the same proportion as Maori in the general population. And I think that that is a nonsense. The so-called principles of the Treaty have often been referred to, frequently in legislation, but have never to my knowledge been fully explained, let alone agreed. And to refer to a “post-1975 consensus on the Treaty” is again a meaningless concept – I know of no such consensus, and the whole reason for the ongoing debate is that there is no consensus about what the Treaty means, or should mean. In one of his Herald articles recently he talked about Maori having a partnership with the Crown, making us, in his words, “one nation, two peoples”. I also think this is nonsense, Lord Cooke notwithstanding. The idea that Governor Hobson envisaged the British Crown – the representation of the most advanced country in the world at the time – forming a partnership with a disparate group of Maori chiefs who were, at that time, scarcely out of the Stone Age, is ludicrous. So I disagree with Gareth’s starting point, and as a result I disagree with many of his conclusions. And the idea of having an Upper House with 50% of its members being Maori strikes me as utterly absurd, and totally at odds with any concept of democracy. Many of our problems today stem from the way in which Te Tiriti O Waitangi – the real Treaty, which Maori chiefs signed – has been reinterpreted to suit the desires of modern-day revisionists. But its meaning is totally unambiguous. The first clause involved Maori chiefs ceding sovereignty to the British Crown, completely and forever. And there can be not the slightest doubt about that. That Maori chiefs understood that at the time is abundantly clear from the speeches made by the chiefs themselves, both those in favour of signing and those opposed to it. This was further confirmed by a large number of chiefs at the Kohimarama Conference in 1860, and confirmed again by Sir Apirana Ngata in 1920. The third article of the Treaty provided that all Maori – “tangata Maori, katoa o Nu Tirani” – should receive full citizenship rights – and this included the many slaves of other Maori, most being held in abject conditions and often the victims of cannibal feasts. Today, we tend to see this clause as no big deal but in 1840 it was an extraordinary thing for the Queen’s representatives to offer – nothing similar happened for the Australian aborigines, or the American Indians. All Maori, no matter their status, were offered the “rights and privileges of British subjects”, putting them on a par with every other British subject – not, it may be noted, ahead of other British subjects but on a par with them. The second clause is what has caused so much angst. Actually, the clause is redundant since all it does is guarantee the right of citizens to own private property, and British subjects have this right anyway. But note that the guarantee was made to all the people of New Zealand – “tangata katoa o Nu Tirani” – in clear distinction to the third article which specifically applied only to Maori – and “all” means “all”. In other words, rights of ownership were guaranteed to all New Zealanders, not just to those with one or more Maori ancestors. There is ongoing debate about what “tino rangatiratanga” meant at the time but it is impossible to believe it meant what modern-day revisionists try to take it to mean. Why on earth would Hobson have asked Maori chiefs to sign a Treaty involving the complete cession of sovereignty in the first clause if the second clause contradicted that first clause? Let me say that I have always supported the payment of compensation by the Crown to any New Zealander, Maori or non-Maori, who can establish with a reasonable degree of certainty that their property has been illegally confiscated by the Crown. There are clearly suspicions that some of the claims which have been settled in recent times have in fact been settled on several previous occasions, and that brings the settlement process into disrepute. But in principle nobody can object to the Crown paying compensation to any New Zealander whose property has been illegally confiscated. So in summary, I like the Treaty: it is a very simple document recording the cession of sovereignty by the Maori chiefs who signed it; extending to them in return the full rights of British subjects; and guaranteeing to all New Zealanders the right to own property. But it does not require us all to learn te reo; it does not provide for separate Maori electorates or Maori wards; it does not give Maori a power to veto RMA resource consents; it does not give Maori any preferential rights over natural resources; and it certainly provides no basis for an Upper House with half its members being Maori. One-parent households are the most likely to have no access to a motor vehicle. I've had a car since I could drive. When we started our family we purchased my car from the company I'd worked for. I'd had it since new and so its history was known to me. My car and my dog (who constantly travelled in it with me) were an extension of self. Having children made having a car even more essential. Not having a vehicle would be, for me, an isolating experience. This is just one more disadvantage single parents have to face. In general it will limit their children's opportunities and experiences. It's not hard to imagine how being carless even puts them at greater risk. I've banged on about single parents for a long time now. It's not personal. It's about this idiot welfare system that subsidises a family structure which doesn't serve the interests of their children. I am incredibly thankful that the teenage birth rate is dropping because that is the source of many single parent families. Long may the trend continue to be a positive one. "I don't think we should help Maori more because they happen to be Maori. That to me is a nonsense. Some Maori are as affluent as I am. Some could be more affluent than I am. Help them because they need help." “Since the system of voluntary registration was introduced in 2003 there have been seventeen cases of reported misconduct of people who worked as social workers or community workers, sixteen of which were unregistered,” says Carmel Sepuloni. An average of 1.3 cases of misconduct a year. Apparently, according to the last census, there are around 14,000 social workers. There were 146,657 care and protection notifications to CYF in the 2012/13 year alone. That's just one arena in which social workers operate. A great number - the majority - of social workers remain unregistered for reasons best known to them. But any additional bureaucratic requirement that would deter people from becoming or remaining social workers will only reduce their numbers. “CYF staff are under enormous pressure. The number of notifications it receives has more than doubled over the last six years, averaging 400 a day. “It has confirmed social workers, who have higher caseloads than in many other countries, are struggling with both the increased demand and higher standards of investigation as cases become more complex and difficult. It seems fairly obvious why calls to make registration mandatory have not come to fruition. Two columns offer quite contrasting views. The David Cunliffe experiment of tacking left is over. That's good news for the Greens: they can hoover up left-wing voters. It's good news for Labour: they have to win the middle to win Government. (BTW Rodney predicted Norman's demise as leader in his Radio Live predictions for 2015). The second from Chris Trotter who, with out providing specific examples, I have a sense often gets things wrong. Under Rod Donald and Jeanette Fitzsimons, Russel Norman and Metiria Turei, the Greens belonged to the Left. Under its next set of co-leaders, especially if their names are Shaw and Genter, the Greens will belong to whoever offers them the best deal. A 3 News Reid-Research poll has revealed 55 per cent of voters think Little is potentially a better match for Prime Minister John Key than his Labour Party leader predecessors. If I'd been asked, I'd be in the 55%. Look what the respondent is being asked to compare him to. 3 News political editor Patrick Gower said the poll result was a huge boost for Little. I think he's 'better' because he appears more decisive. But he decided to do two things that made the chance of me voting Labour even more remote - scrapping the end of life bill and moves to raise the Super qualifying age. In any case, each of Labour's recent incoming leaders has enjoyed initial support and confidence. Hasn't lasted though.